About a year ago Ms. H. R. Puffnstuff (Clinton) called Trump supporters deplorable. It would have been nice if she would have looked up the definition before she stereotyped roughly half the country. But she is a liberal so that’s okay and even funny to her followers. There is some good news for Hil as one of her biggest fans demonstrated the definition so there’ll be no need for getting out her bound copy of Websters famous dictionary (and you know that she still uses a paper copy). Kathy Griffin demonstrated what being deplorable is in just so many ways. Below are some headlines from Breitbart. This article was published on Jun 4, 2017 . 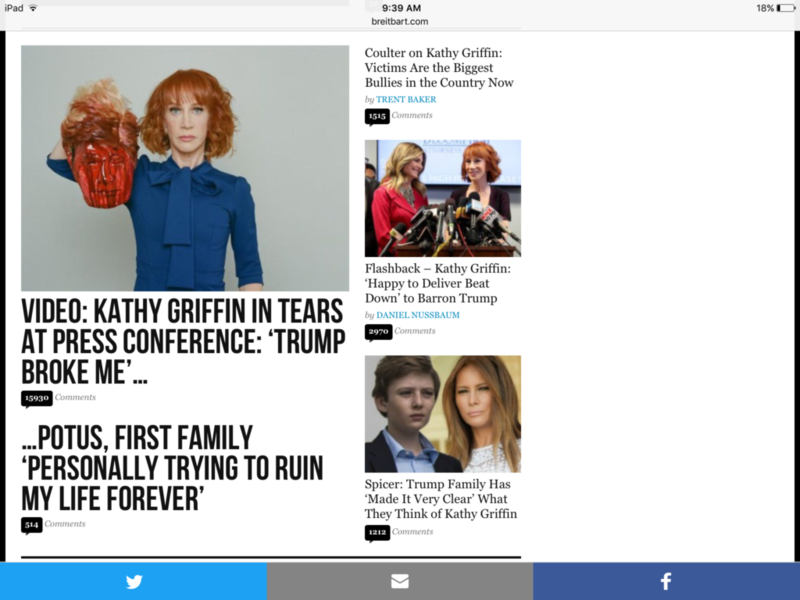 It is tagged breitbart, clinton, Deplorable, hilary, Kathy griffin. You can follow any responses to this article through the comment RSS feed.